Minibus transfers with up to 8 passengers or executive cars, we are here to assist you whenever or wherever you need to go 24/7 365 days a year. Offering you the customer the best service and experience possible, 5 star service is guaranteed. From our Swindon location we cover all of Wiltshire and the surrounding areas, whether your travel requirements are for business or pleasure. Our drivers are hand picked as it is important to get the right kind of person for the job. 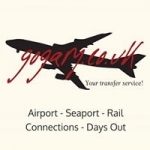 Minibus or executive car transfers Just sit back relax and let GoGary get you to where you need to be. Minibus transfers with up to 8 passengers or executive cars, we are here to assist you whenever or wherever you need to go 24/7 365 days a year. All vehicles have isofix child seat fixing points, (car seats are also available on request) air conditioning, along with complimentary WiFi and bottled water as standard. Are you using GoGary to celebrate something special?.............. then please let us know! Our experienced drivers are all DBS/CRB checked, registered and licensed by the local authority as Private Hire drivers. Our vehicles are all well kept and modern and also registered for Private Hire use with the local authority for use within the Private Hire sector.